Online #AP #PGLAWCET 2019 Notification, Schedule, Online Application Form, How to Apply, Last date, Online Entrance Exam Date, Hall Tickets, Results, Admissions Counselling details are given here. 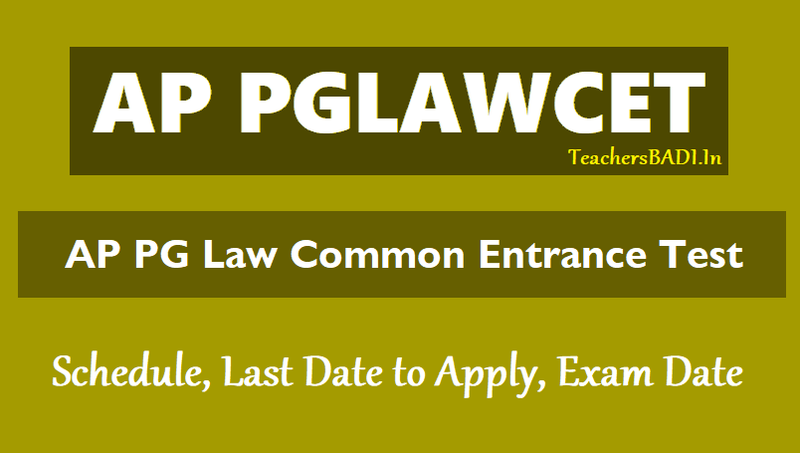 AP PG LAWCET 2019/ PG LAWCET 2019: Sri Krishnadevaraya University, Ananthapuramu, Andhra Pradesh has issued the Post Graduate Law Common Entrance Test-2019 (PGLCET-2019) in February. This entrance test for entry into first year LL.M Regular and Self Financing Courses in the Colleges of Law in Andhra Pradesh for the academic year 2019-2020. The PG Law Common Entrance Test 2019 (PG LAWCET-2019) will be conducted by the Convenor, Department of Law, Sri Venkateswara University, Tirupati on behalf of Andhra Pradesh State Council of Higher Education(APSCHE), Hyderabad. This Post Graduate LAWCET 2019 will be held on 06-05-2019. Sri Krishnadevaraya University, Ananthapuramu, invites Online Applications from eligible Candidates for admission into first year LL.M courses offered by state Universities in Andhra Pradesh including their Affiliated Colleges. b) The Candidates seeking admission into LL.M. (Private Appearance) of Osmania University, Hyderabad shall have a minimum experience of 3-years as a judicial officer or 3-years standing as an advocate on the date of appearing for PGLCET-2019. *Downloading of Hall-tickets from the website http://www.sche.ap.gov.in/lawcet: ..